The discovery of Power Girl #7 (and the following issue, Power Girl #8) has changed my life forever. I am now in the know. Not only do I know of DC's Vartox, but I have also been opened-up to the world with Zardoz, starring Sean Connery. Vartox is a DC character which first appeared in Superman #281 and is based on the appearance of Sean Connery's Zed character from the film Zardoz. From what I could best make out, after watching Zardoz on Netflix instant watch, is that Zardoz is a movie based on the structure of control, both religious (through the use of Gods) and social. Zed (Connery) discovers one level of "God" control after he reads "The Wizard of OZ." 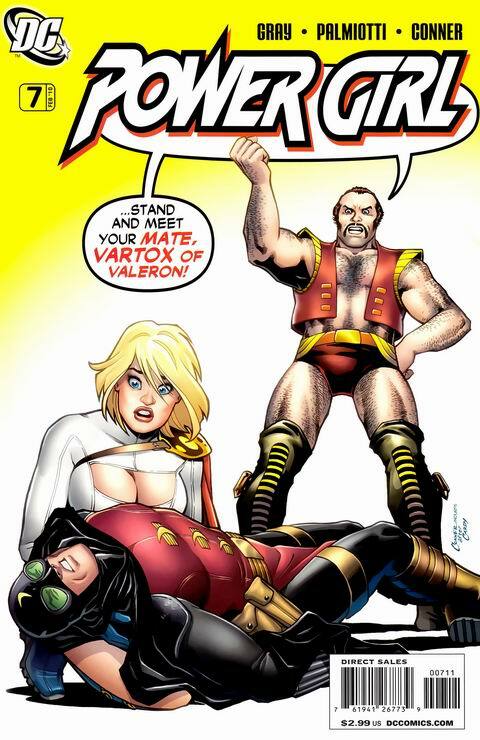 The Vartox character which appears in Power Girl #7 does take some things with him from the movie into the comic of the day: his handlebar mustache, the flying rock head ship, and his skimpy outfit. Besides those things, Vartox is a different person. He is an immortal, super-powered leader of his planet who has come to Earth in search of a mate which will help him repopulate his planet...which has been attacked with a contraception bomb. Yeah, possibly the best set-up for a comic book ever. Vartox is written as an arrogant mocho man who does not understand rejection. His ridiculous third person dialog, written by Jimmy Palmiotti and Justin Gray, is equaled by Amanda Conner's panel perfect facial reactions by Power Girl and Vartox. Conner's panel in which Vartox stops Power Girl from speaking with his index finger is exceptionally enjoyable. Power Girl #7, and Power Girl #8 for that matter, should not go unread and forgotten in time much the same way Zardoz has in the realm of film. The characters populating these forms of entertainment are amazingly out-there and forever memorable. You'll thank me. Well, now I have to watch Zardoz and read Power Girl 7-8. Thanks!